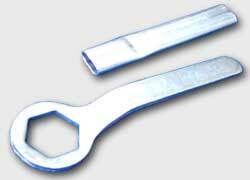 The ring spanner usually has a completely enclosed head, and may have six or 12 flats. A 12 flat spanner engages upon the corners of the nut and can engage both hexagon and square bolts. A six flat spanner is normally shaped to fit against all 6 sides of hexagon nuts, this ensures a very tight fit and can allow considerable force to be applied. Ring spanners are stronger than the open ended type, but they need access to fit them over the nut.